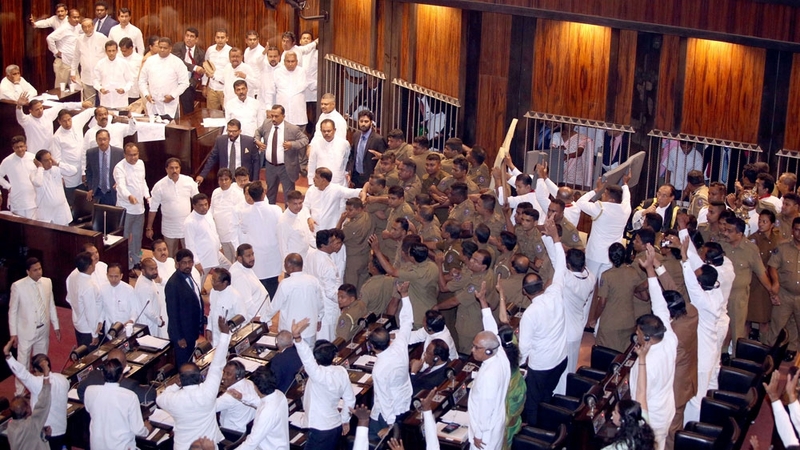 Sri Lanka‘s parliament has descended into chaos for a second day as legislators supporting disputed Prime Minister Mahinda Rajapaksa threw books, furniture and chilli paste at rivals in a bid to block a second no-confidence motion against him. Rajapaksa lost a similar vote on Wednesday, when 122 legislators in the 225-member House passed a no-trust motion against him in a voice vote, followed by a signed document. However, Rajapaksa refused to step down saying that motion should not have been put to a voice vote. Sri Lanka has been paralysed since October 26 when President Maithripala Sirisena appointed Rajapaksa, a controversial former president accused of corruption and grave human rights abuses, as prime minister after sacking Ranil Wickremesinghe. On Thursday, Sirisena held an emergency meeting with the leaders of the political parties that voted for the first no-confidence motion against Rajapaksa. During the meeting, the president asked the leaders to take up the motion again and allow it to be debated before being put to a roll-call vote. Opposition legislator R. Sampathan said it was Rajapaksa loyalists who prevented a roll-call vote on the motion as requested by Sirisena. Rajapaksa himself stayed away from the rioting and walked out of the chamber after the vote. A former parliament staffer said Friday’s scenes were unprecedented. “We haven’t had a situation where the speaker was prevented from entering the chamber,” former sergeant-at-arms Wijaya Palliyaguruge told the AFP news agency. A Rajapaksa loyalist was seen throwing chilli powder at rival legislators and police. Several constables and legislators were taken to the parliament’s medical centre for first aid. Gamini Jayawickrema Perera, a legislator from the party of Wickremesinghe, the ousted prime minister, said he was among those treated after chilli mixed with water was thrown at his face. Vijitha Herath, another legislator, said he suffered a forehead injury when a rival hit him with a hard-cover copy of the constitution that was on the speaker’s table. Rajapaksa’s spokesperson Keheliya Rambukwella denied they attacked police or staff, but blamed the speaker for the chaos. “He (the speaker) need not have rushed the vote,” Rambukwella told reporters in parliament after sittings were adjourned. Sirisena responded to Friday’s raucous scenes in a Twitter post, saying he would not dissolve parliament. He called upon “all parties to uphold principles of democracy and parliamentary traditions at all times”.